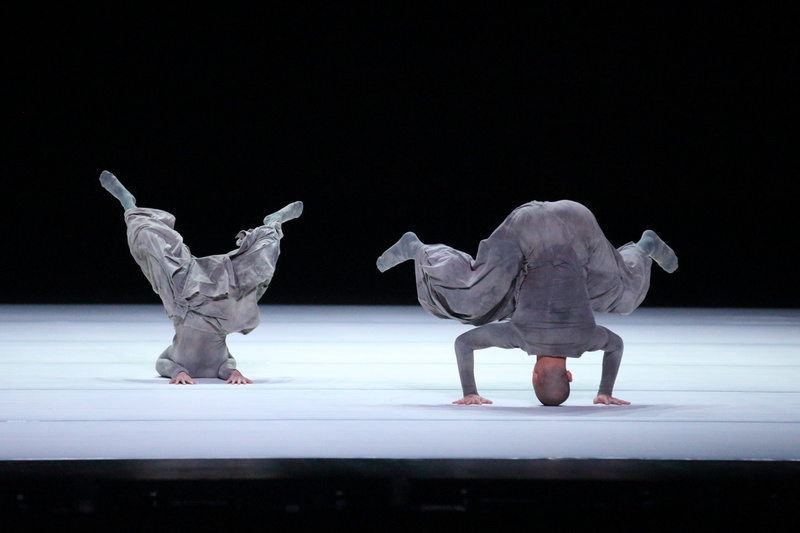 Tao Dance Theatre left their Beijing audience dumbfounded last Thursday evening with a performance of weight x 3 and 2 at the NCPA. Tao Dance Theatre quickly became internationally famous, but it took a little time before they gained recognition in China. So it is a big deal for Tao to be performing in China. Plus this is their first run at Beijing’s biggest venue. The expertly trained, fit Tao dancers have awesome stamina and astonishing athletic control. Each displayed brilliant flow within a rigid frame of quick rhythm and footwork. Duan Ni is particularly malleable, her lithe body twisting (seemingly comfortably) into unearthly shapes. She is outright inspirational. 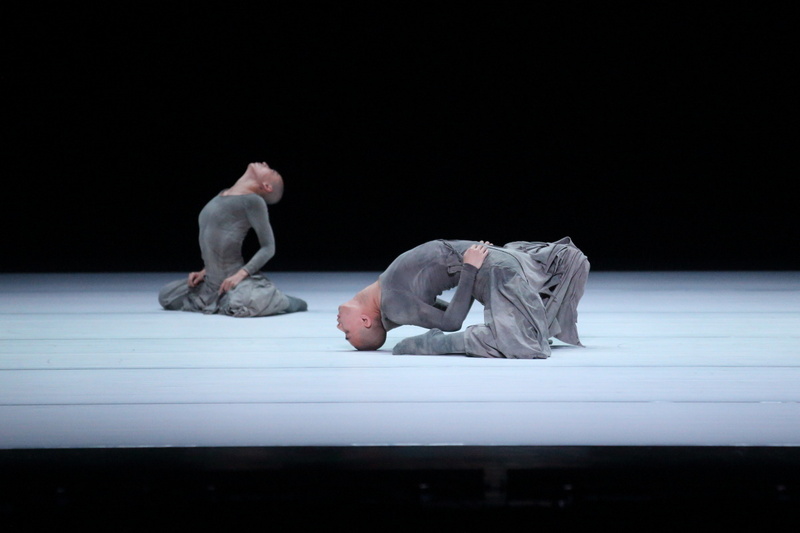 2 opens in stillness – Duan Ni and Tao Ye (artistic director) lie spread eagle, face down on the ice-cap white floor, which looks lit from beneath. After a few minutes of stillness, the sound of white noise fades out and the audience get restless. A few people titter in nervous laughter, unsure of what to expect. Then begin random fits of movement, appearing entirely uncontrolled. The randomness of broken toys. Tao’s hips rise. Duan’s arm flops over her back. One foot hooks across a bent leg, pulling it straight. Duan looks jointless. They stay low and grounded, leading with their hips and core and allowing the spine, shoulders and the limbs to catch up with the impulse, a ripple effect moving through the entire skeleton. Their movement rarely seems muscular, everything is propelled from the centre and remains effortless. The pair (who got married recently, having got engaged on stage in New York together last year) can predict one another’s movements to the split-second. This is visibly more than simply being well-rehearsed. They know in their bones exactly what the other is doing, they are intimately aware of one another at every turn. This is the second time I have seen Tao Dance Theatre in the flesh. (I was lucky enough to see the company perform at Sadler’s Wells, London, in June 2014. Read my review of Tao Dance Theatre’s 4 and 5 here. That was just weeks before I moved to China. Seeing Tao’s 4 and 5 got me all fired up about performing arts in China, and I that was where I just so happened to meet the woman who would put me in touch with Willy Tsao, Artistic Director of four contemporary dance companies based in Hong Kong and mainland China. Read more about Tsao and his company Beijing Dance / LDTX here. N.B. This post is a combination of 100 words from a longer review and additional thoughts thereafter. I watched the show on October 29th, and the full review was published on 31st October 2015 by Bachtrack. Please click here to read the full review.